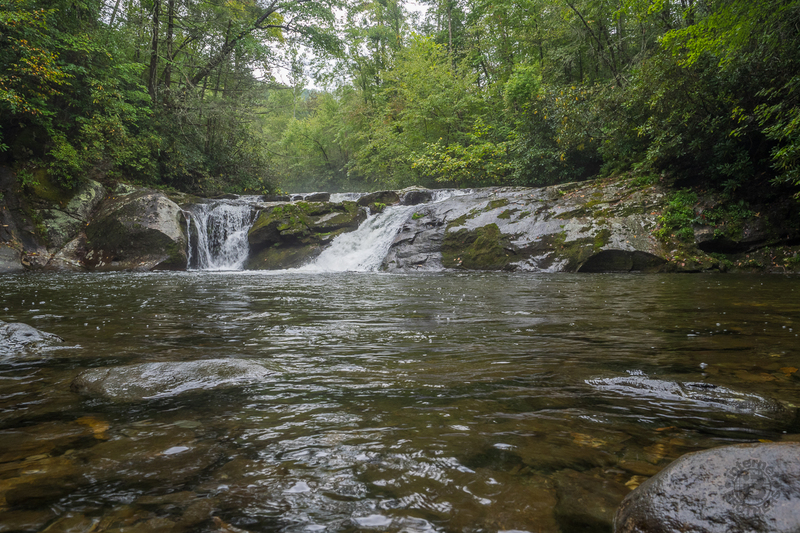 Joyce Kilmer-Slickrock Wilderness straddles the North Carolina / Tennessee line near the southern borders of the states, with about 75% of its 17,000 acres contained in NC. Six trailheads provide access to more than 60 miles of trail within the designated wilderness, which typically follow ridge tops or drop into the shady drainages. Perhaps the most atypical trail though is the Slickrock Creek Trail to Lower Falls in the far northern corner of the wilderness. 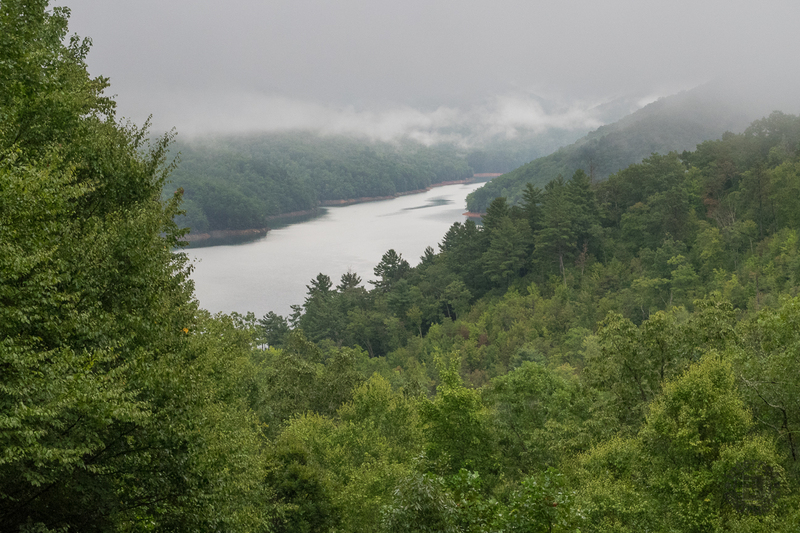 A series of dams on the Little Tennessee River nearly a hundred years ago created Calderwood, Cheoah, and Fontana Lakes providing recreational opportunities for those who visit this region. Slickrock Creek feeds the river and offers the setting for this hike. I joined the Smokies Thursday Hiker’s group on September 10, 2015 from 9:15AM to about 2:30PM to tackle this rugged wilderness trek. Our plan was to follow Slickrock Creek Trail along Little Tennessee River to Lower Falls on Slickrock Creek, then return the same way. Hike Rating: Moderate. Not particularly strenuous, but rugged, uneven terrain. Trail Condition: Most of it is pretty good for wilderness, but erosion has taken a toll on portions of this trail creating slippery rock conditions with exposed roots as well. Some boulder scrambling and one wet creek crossing. Starting Point: Across Little Tenn. River Bridge between Deal’s Gap and Tapoco. Trail Traffic: We encountered no other hikers on this rainy Thursday. How to Get There: From Asheville, NC take I-40 to exit 27, the Great Smoky Mountains Expressway. Continue south/west 49 miles. 12-15 miles past Bryson City, turn right on NC-28 north. Continue more than 20 miles through Stecoah, past Fontana Dam and past Fontana Village. Cross the Little Tennessee River bridge and follow the river road to Deal’s Gap. Turn left on Hwy 129 and plunge down to the river level and cross another bridge at Cheoah Dam. On the south side of the bridge, take a hard, hairpin right onto a gravel road beside the bridge. This is the trailhead. Most of my 2.5 hour drive southwestward to the far corner of North Carolina was undertaken in darkness, but the sun did rise in time for me to enjoy the magnificent views in “lake country.” Between Stecoah on Hwy 28 and the pre-arranged meeting place at Deal’s Gap is some of the most stunning scenery you will find anywhere in WNC. As you pass the Fontana Dam area and then Fontana Village… as you make the first crossing of Little Tennessee River at the base of the massive grey-brown bluffs that overlook Lake Cheoah… as you wind your way in and out, up and down to Deal’s Gap (home to the infamous motocycle adventure known as “Tail of the Dragon”), you will likely find yourself in awe of the picturesque river valley and forest. This area is without question on my to do list for autumn foliage. 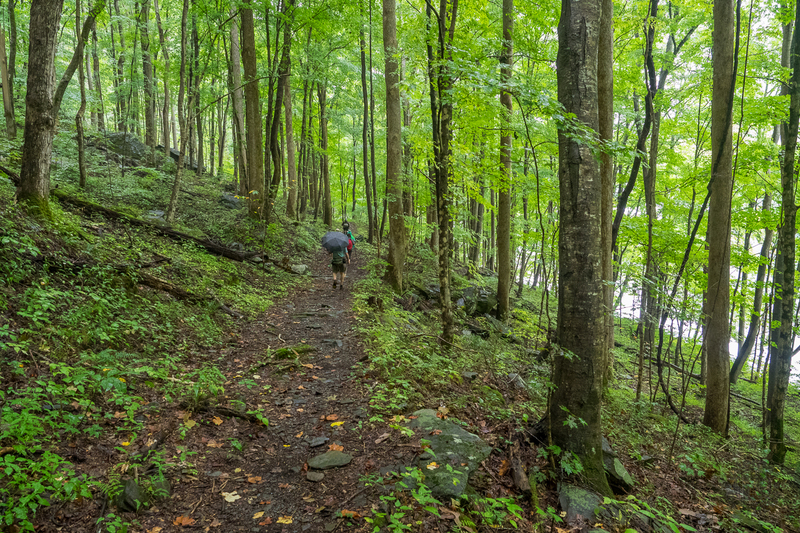 I was meeting up with a Tennessee contingent known as the Smokies Thursday Hikers for a foray into the northern confines of Joyce Kilmer-Slickrock Wilderness. For them, Thursday morning hiking has been a regular thing for years and years. For me, I was representin’ for North Carolina on my first trip with the group. I couldn’t have been greeted with a more warm welcome. The sky looked threatening over Fontana Lake, but the combination of cold water and damp, warm air made for an interesting fog-shrouded setting. The Smokies national park is on the north side of the lake (right), while the south side lies in Nantahala National Forest. We all did the meet and greet thing at Deal’s Gap then headed south and down on Hwy 129 to another crossing of the Little Tennessee. This one lies beneath the massive Cheoah Dam, made famous in the 1993 movie “The Fugitive” starring Harrison Ford. After escaping from a train in the Bryson City area, Ford’s character Dr. Richard Kimble eventually ends up making an incredible leap from the top of Cheoah Dam into the frigid Little Tennessee far below. An interesting backdrop for our trailhead for sure. The Slickrock Creek Trail begins on the south side of this bridge, right after you cross it. There are no signs that mark its presence, just know that immediately after crossing the bridge you need to turn off Hwy 129 onto a short gravel road with minimal parking. The four vehicles in our group were stretched out a hundred feet along the side of the highway. Just as we were all smiling for a group picture on the bridge in front of the imposing dam, the threatening skies decided to become more than just a threat. We all scrambled for rain gear and began hiking a few moments later all bundled up against the wet. Within a hundred yards we came to the Nantahala Forest sign that denotes the entrance to Joyce Kilmer-Slickrock Wilderness. For the first two miles of this hike, in a northwesterly direction, the trail parallels the Little Tennessee, or as it is known in this area: Calderwood Lake. There are three dams in the region, part of the work done by the Tennessee Valley Authority nearly one hundred years ago. Fontana Dam created Fontana Lake at the southern foot of what would become Great Smoky Mountains National Park. Cheoah Dam, where we started, confines the river again several hundred feet lower, and then a few more miles downstream the Calderwood Dam creates the lake alongside this trail. Each has its own special appeal. The forest is deciduous hardwood, a mix of buckeye, oak, hickory, fraser magnolia, and other aromatic varieties. It was nut season, as we saw the droppings of each along the path. So too did we find buffalo nut, a new one for me. These pear shaped nuts were about the size of ping pong balls and hid beneath the leaves of the host tree. Along this two mile stretch the trail itself rollercoasters, though the elevation difference never exceeds 50 feet or so. We hollered at a lone kayaker on the lake below, and crossed a few very slippery man-made foot bridges over the occasional drainage tumbling down from the Unicoi Mountains. Our group of 11 tended to spread out along the trail as good conversation, and shedding of rain jackets on this very muggy day led to each setting their own comfortable pace. The day started with umbrellas and rain jackets. That didn’t last long, however, as the very high humidity made us wetter from sweat than from rain. After about an hour we heard that tell-tale sound of whitewater ahead. Rushing water in the forest is unmistakable. We were approaching Slickrock Creek, where it plummets with a force into the river/lake. Slickrock Creek is the state line between North Carolina and Tennessee. The trail turns decidedly to the southwest as it now follows along the NC side of the creek. This is drainage from Bob Stratton Bald, a scenic high-mountain vista we had enjoyed just a few short weeks before. With the new direction, and new water companion, we also encountered much more treacherous terrain. Over the course of the next mile-and-a-half as we followed Slickrock Creek, we would gingerly navigate the layered strata that lines the gorge of this waterway. It became exceedingly obvious how this stream, and wilderness in general, got their name. It is VERY slick rock indeed. To make it even more difficult, it began to rain again. In fact, as we proceeded deeper and deeper into the wilderness, members of our group wisely chose to drop out at particularly gnarly obstacles along the way for safety reasons. Between carefully chosen steps, though, we were treated to bright, beautiful cardinal flowers springing up from the creek bed. So too did we find the appropriately named hearts-a-bustin’, as well as teeny-tiny radiant orange cinnabar chanterelles mushrooms hiding within the thick carpet of verdant partridge vine. Many of these were flowers I had only heard about, or seen in pictures, but finally got to enjoy in person. It’s amazing really, the length of the wildflower season in the Smokies. Starting in late March, with varieties changing weekly through October, we are blessed to experience something blooming for our delight more than half the year. By the time we reached the creek crossing just a quarter mile from Lower Falls, we were now down to only four of our crew. We paused to make sure we had our footwear ready, the electronics safely stowed, and our nerves properly prepared for the wet and wild passage across Slickrock Creek. On the other side of this boulder strewn, 30-foot-wide stream lies Tennessee, and access to our destination. We wouldn’t be Meanderthals if we stopped now, so into the current we stepped. Surprisingly, the water wasn’t especially cold. The deepest point was probably no more than a foot, not even reaching our knees. Some of the rocks were like walking on loose, rolling, wet bowling balls, but mostly it was a piece of cake. All four of us reached the other side without incident… good news knowing my history. The rest of the way to Lower Falls is simple. First we went beyond the falls for a view from above, then backtracked. We had to descend a pretty steep embankment about 20 feet to get to water level, and an island that was a great spot for lunch and the best view of the waterfall. Lower Falls is a twin waterfall, with each cascade separated by about 15-20 feet. I called them the North Carolina falls (on the left) and the Tennessee falls (on the right), as the state line is split right down the middle. While we enjoyed lunch and our surroundings, to make things all appropriate, I sat on the North Carolina side of the island while the other three sat on the Tennessee side. Thankfully the rain stopped, so we were able to relish the scene in relative comfort. From the base of the falls you can see the summits of the Unicoi Mountains high above. On the other side lies Cherokee National Forest and Citico Creek Wilderness. The Slickrock Creek Trail actually continues on, 12 miles total, to Wildcat Falls and Big Fat Gap. But this was today’s destination. Fully nourished now, it was time to head back. We didn’t want the others to worry, or to have to wait too long for our return. We stopped briefly at a much smaller waterfall just off the trail that has a unique piano wire or angel hair drip. Once again, we all made it safely back across Slickrock Creek. It was time to put on dry socks and remove all the wet gear to make better time on the return trip. Things did seem to go smoother. While still occasionally disconcerting, the terrain didn’t seem quite as treacherous on the way back. Perhaps I was more prepared for what to expect. There is one stretch where the trail is basically hanging on the strata with the creek only abut 3-4 feet straight below. I can imagine during the spring runoff that this may be completely underwater. When we got back alongside Calderwood Lake, apparently there had been a release from the dam because a shroud of fog now covered the surface. Colder water, released from the dam, mixed with the warmer air produced an eery, but beautiful cloud in the woods. The forest was really, really green from all this day’s moisture. The rest of the crew was patiently waiting when we got back to the trailhead. We swapped stories, patted each other on the back, and shared an ice cold beverage. It had been a really good day. In summary, despite the conditions, I thoroughly enjoyed this hike. Good company, beautiful scenery, plenty of wildflowers and nuts, and a brand new place for me. Some in our group, particularly the older ones in their eighties, thought this a little too dangerous in the wet, slippery weather. Take that into account when considering the hike for yourself. The drive to the location is stunning. I would recommend it no matter the season. The hike won’t wear you out physically, but it might wear you down mentally. You won’t be huffing and puffing from exertion, but you may get stressed by the nature of the terrain. Perhaps come on a dry day though, so the Slickrock Wilderness isn’t quite so slick.